Opera Mini team has released a new version of its Opera Mini 5 browser to Opera Mini 5.1. The new version of Opera Mini browser has been enhanced for improving browsing experience on phones with limited memory. This update includes a new optimized browser skin which allows more pages to be open simultaneously, more rapid scrolling through the pages and overall improved browsing experience. The new Opera Mini 5.1 browser is being designed to target those who have encountered out-of-memory issues or the need to reload open web pages while surfing with Opera Mini 5. According to Opera, the new Opera Mini 5.1 is highly recommended for users of Nokia S40 feature phones with limited memory such as Nokia 5130 XpressMusic, Nokia 6300 and Nokia 2700 phones. Beside that, the new Opera Mini 5.1 is also benefit to phone with a small screen size such as Sony Ericssion K550i and Sony Ericsson W810i phones. Full page overview and zoom. Synchronize bookmarks, Speed Dials and other info w/ Opera Link. Optimized UI for keypad and hybrid devices. Integrated and customizable search engines. Saved pages for offline viewing. Privacy management (clear history, bookmarks, cache and etc). Optimized UI for touchscreen devices. Accelerometer support (for switch to landscape mode). Smooth animations in user interface. 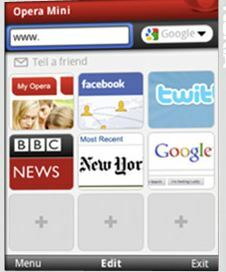 The Opera Mobile 5.1 Windows Mobile browser is available for free download to install from desktop or directly download from m.opera.com by using mobile phone default Web browser.